“Are you scared of leeches, Matt?” It wasn’t a question I had been prepared for or was thinking about. And it wasn’t that I was as scared of encountering leeches as I was scared of stumbling across a tiger or python (can one really stumble upon either? It would seem that once the stumbling has taken place, it’s likely too late. “Oh look, is that a tiger behind the tr…”), but it was just that their presence here was, well, unexpected. We had just started a two-day trek into the jungles of Southern Laos, and Dak, our guide, was giving me a briefing on what we would be doing. Over the next 48 hours, we would be ziplining across canyons and by waterfalls (17 ziplines in total), trekking up steep and muddy mountainsides, and rockclimbing in the mist of a waterfall (sounds like another slippery combination). All of these challenges I was prepared for – heck, I had paid for them, right? – but no where on the website had it mentioned the leeches. 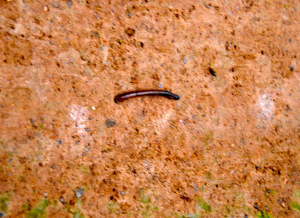 But it was rainy season in Laos, and evidently that meant it was leech season. I nervously pummeled Dak with questions. “Tell me more about these leeches, Dak. Do they drop from trees? Do I only get them from river crossings? Were we planning on crossing rivers?” I vaguely remembered hearing or reading somewhere that leeches hissed, and I didn’t think that they flew, but this was the jungles of Laos, so it probably wasn’t out of the question. My entire knowledge base about leeches came from the 1986 film Stand By Me and its memorable scene where four friends, on quest to find a dead body, emerged from a swamp crossing covered in black leeches. Gordy, played by Wil Wheaton and the main character and narrator of the film, finds a leech attached to his testicles and, after removing it, collapses to the ground. “They come from the ground and the leaves and look like little caterpillars,” Dak said and pounded on the narrow trail around us. “They crawl into your shoes and up your legs. And, Matt,” Dak looked around and dropped his voice to a whisper, “they will crawl up your leg and bite your ball.” Splendid. He also added that when he was young, he had one on his tongue, and his sister had one on the inside of her eyelid. Seeing that he had sent me into panic mode, Dak smirked proudly and walked ahead. As panic set in, I had two thoughts. First, I had to be on high alert for leeches. And second, I had to do my best not to get startled. You see, when I’m startled, I scream like an old lady. Come up from behind and surprise me, and I’ll elicit something that sounds like a four-year-old sucked on a helium balloon. And here in the outdoors with men of field and forest and a group of strangers, an old lady scream was a liability. My eyes scoured the trail ahead of me: dirt, brown leaves, dirt, leaves again. Was something crawling up my leg? A quick check – nothing’s there. My clothes were suddenly alive with bloodthirsty creatures looking to cozy into my crotch and shoes. And we had a long 7 hours to go until we reached our destination: A jungle tree house, nestled in the canopy forest of the Dong Hua So mountains and next to a waterfall. Thankfully, the morning’s journey distracted me from the crotch-seeking leeches. 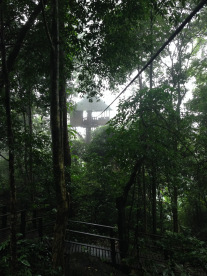 We ziplined hundreds of feet in the air across gorges and through the mists of massive, picturesque waterfalls. Perhaps I should have been more concerned about the two minutes of gear instruction conducted in broken English than the jungle leeches, but the uniqueness of the experience overwhelmed me. Alone on a 500 meter zipline and surrounded by pristine jungle and waterfalls, it was like traveling back in time, for anywhere you looked, there was no sign of humans or society. If there was a place to go down, this might be it. 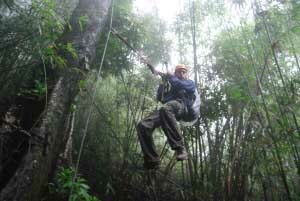 And with everything slick with rainy season muck – trail, gear, bridges, ziplines, hands, the small wooden stick to be used as a handbrake – there was no reason for concern about Lao safety standards, right? I was waiting my turn at a canopy-level river crossing when I glanced at my feet. There, at the point where my sock met my ankle, was an ugly little leech, furiously trying to burrow into my waterlogged shoe. I reacted swiftly. After stifling the urge to old lady scream, I flicked the leech from my ankle and onto the jungle floor. He regrouped quickly, and like a miniature jungle serpent, slinkied his way toward me. I moved. He pivoted without hesitation. I moved again. He pivoted again. Could he smell me? He had food on the mind, so I did what any trekker acting in self-defense would do: I stepped on him. It was a gentle step because, afterall, this was an eco-tour. I moved my shoe to assess the damage. Like one of those inflatable advertisements outside a used car lot, he rose once more from the jungle floor and swayed in an attempt to reassess on the target. I glanced around me and, sure no one was watching, I stepped on him again, this time deliberately smearing him into the mud. Matt: 1, Bloodthirsty jungle leeches: 0. “Matt,” Dak called, “time to cross the bridge and have lunch.” The “bridge” was in fact a swaying, slippery, hanging bunch of boards hundreds of feet over trees and a roaring waterfall. During the dry season, this bridge would be challenge enough. Add torrential rains, jungle slime, and the reverberations of fellow travelers’ feet, and you have the foundation not only for a near-death experience but a scenario likely to be endlessly replayed in stress dreams. Using the bolts that held the bridge together for traction to stay upright and thoughts of lunch to drive me forward, I made my way across the gorge with the speed of a rainy season snail. Mekong catfish, bamboo shoots, and sticky rice, served on banana leaves. A delicious victory celebration over the leech. The clouds and rain settled in after lunch. The guides maintained a vigorous pace, and we scurried up slick trails, wound our way through stories-high bamboo forests and zipped off into the fog, unable to see what (or who - flying Jungle Tiger?) lay more than a few feet ahead of us. Conversation was drown out by the rain and the steady crash of nearby waterfalls. As the first person zipped off into the unknown, we listened intently for thuds, screams, and calls for help. Confident that our pioneer had found a platform elsewhere in the jungle, we gave a collective sigh of relief, and one-by-one hooked in our carabineers and pushed onward to camp. It was late afternoon when we stumbled upon something that was a scene out of a children’s book: a network of treetop bungalows nestled next to a hundred meter waterfall where we would be spending the night. We hustled into camp, dropped gear and wet clothing and began to check ourselves and each other for leeches. An obvious few were found and removed, but I still had one more place to check. I grabbed my bathing suit and headed to a changing room. I readied myself for a Wil Wheaton moment, but thankfully, it was not to be. It appears that only one of us – me and the leech - reached our desired destination today. But tomorrow is another day in the leech-filled jungles of rainy season Laos. Thankful that I had survived both leeches and Lao safety standards for the day, I headed for the waterfall to wash off sweat, jungle muck, and anything else still clinging to me.